In any case, the heading does not suggest a detailed discussion on the principles of jihad. The emphasis here is rather on that dichotomy between the kings and the Sufism, vanished in the Divine Vicegerency but reappearing here stronger than before. 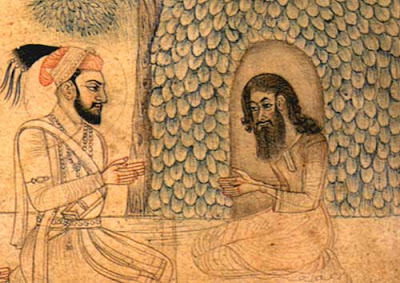 The Sufi has rebuked the king at his face, but you know why the liberty is being taken, and so does the king: the Sufi has “dominion over the outward and inward forces of the universe,” like Bu Ali Qalandar. You have come full circle in the lesson about the self. It started with a contrast between power and love, which was resolved into a unity. The contrast has reappeared now, but you can see more than what meets the eye. Accordingly, the next chapter is a kind of summary, as if things are beginning to move towards a conclusion in this part of the enclave. The problem with the Muslims of this era is that they do not read the Holy Quran and then think philosophically. 'There is no compulsion in religion'.Then in Prophet Mohamad SAW time people practising different religions were living in the same towns. Jihad had in this century has always been implied wrongly. you ared oing Jihad protecting your soul and body, your mother is doing Jihad raising you as a good person ,your wife is doing jihad raising your children to be a good part of society, and then comes the Jihad if you have an evil ruler, after that comes the Jihad if there is an evil ruler in your neighbour. But that only implies if you have all the qualities of Jihhadi. Can we see that around us????????? ?